St Andrews church serves a large congregation in Eaton Village which is located just outside the city of Norwich on the south side. A sizeable extension was built onto the old church in the 1980s to accommodate the ever-increasing number of people wanting to attend and it was in this part of the building where a problem had developed with the Terracotta tiled flooring. The tiles chosen by the architect were made from a surprisingly soft terracotta clay which had been sealed with an oil-based product (probably Osmo Polyx Oil or similar) but the coating generally had worn away badly, particularly along the main foot traffic lane up the aisle to the altar. The overall appearance was extremely tired and dull with wide lanes of ground-in dirt. The clients asked us to clean the floor and replace the thin oil finish with something more durable and easy to maintain. Our first job was to remove the now very patchy finish and deep-clean the entire surface of the floor. 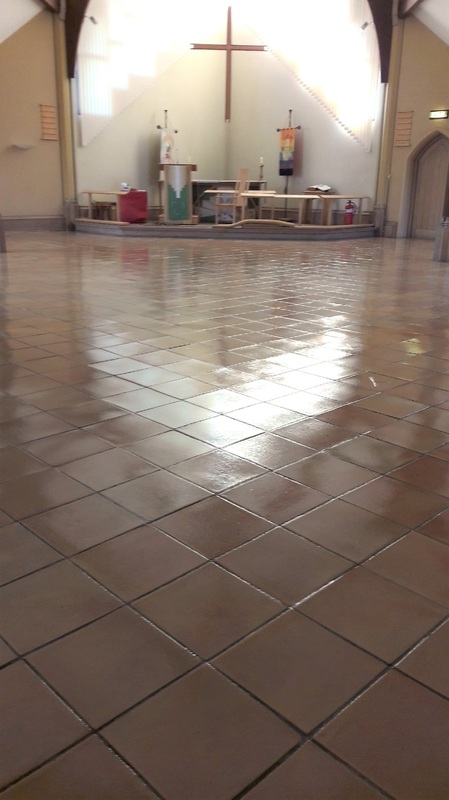 This was achieved using a strong solution of Tile Doctor Pro Clean mixed with a generous quantity of Tile Doctor Remove & Go. The combined solution was left to soak into the Terracotta tile and grout for about twenty minutes before being agitated with a green scrubbing pad fitted to our rotary machine. The tile was so soft I felt that a black pad would probably have been too harsh and may have damaged some of the religious symbols which had been moulded into a number of individual tiles. The resulting clay, dirt and sealer slurry was then power rinsed and vacuumed away with our Ninja machine. These machines force hot water under high pressure onto the floor and then extracts the resulting soiled water away with suction. It was an expensive investment for the company, but it certainly makes work like this much easier. Any remaining soiling in the grout lines was removed by hand using Tile Doctor Oxy-Gel which is a more powerful but manageable gel form of Pro Clean. Also, there were a few really stubborn areas in the corners where the oil finish had pooled and hardened during application. To deal with these and completely remove the shiny patches it was necessary to use a 100-grit hand-held diamond block. After a final rinse to remove any trace of cleaning product the whole floor was left to dry off overnight, assisted by two industrial fans and a commercial dehumidifier. 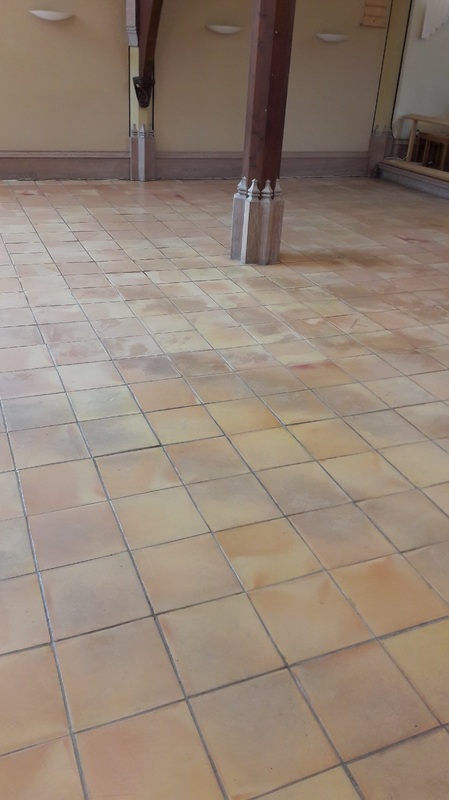 On returning to the church after the previous day’s cleaning, we spot tested the tiles across the whole floor area and found that the fans and dehumidifier had done their job and the substrate was easily dry enough to accept a sealer. We knew that a damp proof membrane had been laid under the floor at the point of installation, so moisture ingress wasn’t going to be a problem. What was an issue however was the high porosity of the clay tile now that it had been stripped of ingrained dirt and the old sealer. I usually apply Tile Doctor Seal and Go to Terracotta tiles as it leaves the floor with an attractive subtle sheen, however we realised that the floor would probably soak up around a dozen coats or more if applied directly. With this in mind we decided to start with the application of two base coats of Tile Doctor Colour Grow. Colour Grow is a penetrating sealer that would occupy the pores of the Terracotta tile, protecting it from within whilst enhancing the natural colour of the clay at the same time. This was then followed by six coats of Seal and Go which enabled us to achieve the desired level of durability and sheen. “After careful consideration of several contractors, it was decided that Nicholas White provided the most sympathetic solution to our flooring needs and at a competitive price. The work was completed as promised with minimum fuss. At all times Nicholas and his staff worked in a professional manner and were totally respectful of their sensitive surroundings. Nick has completed an excellent job, just as we wanted and as he had advised. Would not hesitate in recommending Nick and Tile Doctor. A friend called while work was in progress - she was very impressed and hopes to use them in the new year. I was completely satisfied and it was a pleasure to have them in the house. So pleased with the prompt,helpful advice we have received from Nick.The work was carried out with care, attention,and consideration for our home. We would not hesitate to use Tile doctor again in the future. Prompt, professional and a joy to deal with. I shall try and avoid damaging tiles in future but Nick did a fabulous job - the cracks have vanished on our limestone floor and also a lovely job of restoring slate tiles in our porch. Very grateful to the Tile Doctor for the recommendation which we would pass on without hesitation. very friendly and professional, thank you. Nick White and his partner did a thorough job with our floor, removing old varnish, dirt and efflorescence and leaving a good finish. All work was completed within 2 days.